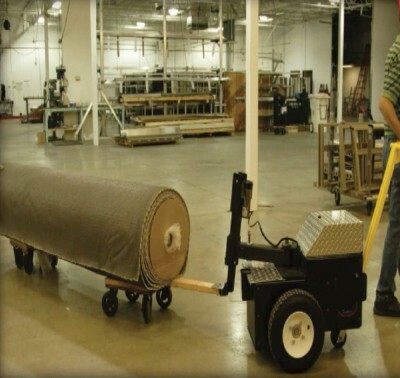 A strong industrial battery powered electric tugger for moving up to 20,000 lbs. The Tug XL has a range of hitches. The most common are the ball hitch, pintle hitch, tongue hitch, pin hitch, tow bar, cable spool adapter, roll stock adapter, push pad, “fifth” wheel, and others. We can also make a custom hitch for your application. The standard features on the Tug XL battery powered mover includes: ergonomic handle, thumb controls, safety switch, safety horn, key switch, onboard charger, maintenance free tires, emergency stop, battery indicator gauge, and more! This machine is made from ¼ inch thick steel and is built to handle the abuse of an industrial environment. If you need a heavy duty powerful machine, this could be the tug for your circumstances. Feel free to contact us to discuss the best machine for your specific application. Our staff are trained to help you find the best answer.